Occasionally, I use my weekly blog to try and interpret demanding subject areas of the Rules of Golf that many players find confusing. This blog concerns one of those areas and if you are a casual golfer you might want to skip straight to my next heading (re Patrick Reed), as this somewhat complicated issue is unlikely to be of interest to you. Conversely, if you are a Committee member, Rules official, or just a Rules enthusiast like me, keep reading. The Committee may only establish Local Rules for local abnormal conditions if they are consistent with the policy set forth in Appendix I of the Rules of Golf. “If there is doubt whether a ball is in or is lost in the water hazard (specify location), the player may play another ball provisionally under any of the applicable options in Rule 26-1. There are three points here that I would like to draw your attention to. Firstly, note the different wording in this specimen Local Rule compared to Rule 27-2, Provisional Ball. 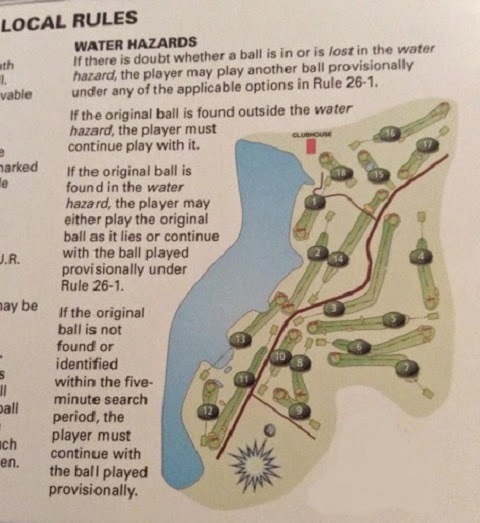 It is the use of the phrase "ball played provisionally" (3 times), as opposed to "provisional ball", highlighting that the ball is being played under Rule 26-1, Water Hazards, and not Rule 27-2, Provisional Ball. Secondly, this is a very rare instance in the Rules of Golf (unique?) where the player may have a choice of which ball he wishes to continue to play with; the ball found inside the water hazard or the ball played provisionally. Thirdly, note that if a player is uncertain as to whether their ball has crossed over the water hazard, or has landed in it, they may proceed to where their ball last crossed the margin and drop and play a ball provisionally, under option 26-1b, dropping it outside the hazard, on a line from the hole through where the ball last crossed the margin. In short, the ball played provisionally does not have to be played as nearly as possible from the spot at which the original ball was last played, though that is still an option. I hope that I have sufficiently emphasised that this Local Rule is not relevant to most courses and certainly cannot be applied to all holes with water hazards, as seems to be the case in the photo above. I strongly recommend that even if a water hazard does meet the two important qualifying conditions for its introduction, Committees should consider very carefully before implementing it, as it is bound to lead to confusion amongst players, especially visitors to the course. For example, a player may think that they can play a ball provisionally when it is obvious that their ball has come to rest in a water hazard. In that situation, the Local Rule is not applicable and if another ball is played that is the ball in play, even if the original is subsequently found to be playable in the hazard. I started by warning you that this is an obscure and difficult area of the Rules! My principal reason for covering it is to warn Committees against its introduction, unless they are absolutely certain that a water hazard on their course fully meets the restrictive conditions. If those requirements are ignored it is possible that its introduction could invalidate the course rating for handicapping purposes. I promise to return to a less esoteric subject next week! Love him or hate him you have to admit that Patrick Reed, currently ranked No.16 on the Official World Golf Rankings, is an interesting character. Whichever side you are on this article by Shane Ryan is definitely worth reading. So, is it required to announce to my marker, opponent or fellow-competitor that I am playing a "ball provisionally"? No the provisions of Rule 27-2 do not apply to a ball provisionally played under the Local Rule re Rule 26-1, though it would obviously be sensible to do so, to avoid any confusion. In the example you gave of the committee allowing a player to take a penalty and go to the other side of the hazard, could a drop area be established, as they are on par 3 holes sometimes? No. That is the whole point of Decision 33-8/2. It is not permitted by R&A / USGA. I remember watching Charlie Hoffman of the PGA Tour showing his marker, Jim Furyk his ball; Hoffmann wanted to replace it, presumably because of some blemish and Furyk would not agree that the ball should be declared out of play. Incredibly and petulantly, Hoffman then called for a ruling! My course has a number of water hazards with reeds growing 3 to 5 feet. It's not uncommon to see your ball clip the far side of the reeds - and not know if it went through or fell. Once you walk around, there is well cut fairway and you will either see your ball imediately, or know it's in the hazard. ...If it is known or virtually certain that the original ball is in a water hazard, the player may proceed in accordance with Rule 26-1. In (this) situation, if the player makes any further strokes at the provisional ball, he is playing a wrong ball and the provisions of Rule 15-3 apply. I read this to mean that if the ball is found in the hazard (or virtually known to be there), that the Provisional ball is now a "wrong" ball, or not playable. Does that mean player proceeds under 26-1 with the original ball? I thought if the original ball is found in the hazard, it must be played as it lies, or play continues with the provisional. Very confusing! My ladies' club wants a Provisional ball local rule put in place for a 100 yard par 3 located on a rise over water. The area in front of the teeing ground is covered in tall grass before the hazard, and there is no fairway area on the other side of the hazard other than sidehill rough and a waste bunker. In summer there are tall weeds that make it difficult to see if a ball has crossed the hazard. There is a drop zone in front of the tee boxes, about 75 yards from the green. I think implementing the local rule is confusing and opening a can of worms. I've read all your blog posts concerning this issue, but the rules seem confusing and vague. Could you address what the options/non-options are if the original ball IS found on the other side in the shallow part of the hazard, or outside of the hazard if a Provisional is played (assuming we adopt the local rule). You say that your ladies club [Committee] "...wants a Provisional ball local rule put in place for a 100 yard par 3 located on a rise over water." I have to point out that a) the only permitted Local Rule is one that uses the wording in Appendix l, Part A, 5, and b) the par-3 that you describe does not seem to meet the requirements to implement this Local Rule. This is important because it could invalidate handicap counting competitions. Committees should definitely obtain permission from thir regional/national golf authority before introducing this Local Rule. To directly answer you questions; if the original ball is found outside of the hazard the ball played provisionally under the Local Rule must be abandoned; if the ball is found inside the hazard the player may choose to continue play with either the original ball, or the ball played provisionally under the Local Rule. My strong recommendation is that this Local Rule for 'Playing Ball Provisionally Under Rule 26-1' is not adopted, as it inevitably leads to player confusion. Thank you, Barry. I'm on the Committee, and I agree with you! The approved local rule ball played provisionally under R26 is in place (appropriately) and a player has proceeded correctly in playing such a ball provisionally when his original shot may be in a lateral water hazard. He subsequently finds the original ball within the 5 minute limit so must choose which ball to proceed with. My question is the interpretation of the language "the player may either play the original ball as it lies or continue with the ball played provisionally under R26". Can you confirm whether this means he cannot choose the original ball and then take R26 relief with that ball? If he did so, has he proceeded from a wrong place under both a R20-7 penalty and a R26 penalty? I agree this local rule appears to involve considerable complexity, yet I can find no guidance on such issues from the ruling bodies in the manner of decisions on the main rules. Are you aware of any published material on such issues?